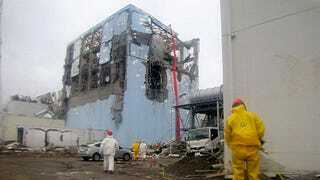 Fukushima is Japan's radiation nightmare that just won't go away. Ever since March 11, 2011, the damaged plant has been riddled with leaks and cleanup setbacks. Now Tepco, the operator of the damaged facility, says they've recorded spikes between 50-70 times above average readings in the gutters that pour water into a nearby bay. The levels of beta ray-emitting substances, such as strontium-90, measured 5,050 to 7,230 becquerels per liter of water between 10:20 a.m. and 10:50 a.m. Tepco requires radioactivity levels of groundwater at the plant discharged into the sea to remain below 5 becquerels. Officials say they've shut the gutter so contaminated water won't leak into the Pacific Ocean as they continue monitoring the situation. Later in the day, the leak continued but fell dramatically to only 10 to 20 times regular readings. AFP reports that this new problem joins a litany of other leaks (seriously, it's been a bunch) as Japan and Tepco continue to struggle with decommissioning the damaged plant.